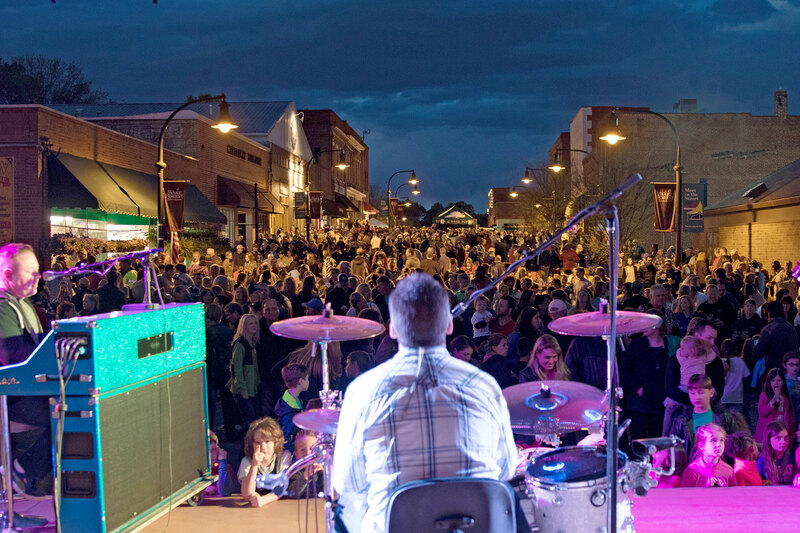 Sleeping Booty will headline the 2019 celebration and take the stage at approximately 6:15 p.m.
A 12-piece band that features a horn section, percussion and multiple lead vocalists, Sleeping Booty delivers a high-energy, choreographed show covering popular hits from funk, rock and R&B to hip-hop, jazz and beach. But what about the fireworks? Not to worry! This yearÃ¢â‚¬â„¢s fireworks will be bigger and better than ever and guaranteed to provide a thrilling end to an unforgettable evening. PLEASE NOTE: The fireworks show will begin at dusk, but there is no official start time. The Town of Wake Forest will provide an event map that highlights important points of interest during this year's Fireworks Spectacular, including parking, restrooms, concessions and more. Attendees are urged to park in one of several designated parking lots on the Heritage High School campus. Handicap parking (by identification only) is also available on the school campus. Please note: Parking will not be permitted along Forestville Road or Foundation Drive. The free shuttle will run continuously and drop off visitors in one location on the Heritage High School campus. Please note: The final shuttle will depart from Heritage High School at approximately 11 p.m. Concessions, including hamburgers, hot dogs, popcorn, and snow cones will be available at the Fireworks Spectacular. Several food trucks will also be on site. Picnic baskets and/or coolers are allowed - but alcoholic beverages are strictly prohibited on the Heritage High School campus. Families are welcome to tailgate in the parking lot. The program will begin at 6 p.m. and Sleeping Booty will take the stage at approximately 6:15 p.m. The fireworks show will begin at dusk, but there is no official start time. No alcoholic beverages, smoking, glass or pets are permitted on the Heritage High School campus. Lawn chairs and blankets may be set up in designated areas, including on the football field, but not on the track. No bicycles allowed inside the stadium. Following the fireworks, no vehicles will be permitted to enter the school grounds until all the traffic exiting the stadium is clear. The Wake Forest Parks, Recreation & Cultural Resources Department will offer sensory support items, including noise canceling headphones, weighted blankets and fidgets, for individuals with sensory sensitivities to check out at the Wake Forest Information Tent. Anyone wishing to check out one or more of these items will be required to provide a photo ID which will be returned when they check the items back in. For more information, contact Specialized Recreation Specialist Kelly Schurtz. In case of inclement weather, updated information will be posted on the town's website and the Town's Facebook page. In addition, smartphone users who have downloaded the Town of Wake Forest app will receive a push notification message informing them of any schedule changes.